Port Hueneme, CA – Each year, Championship Wrestling from Hollywood delivers a suite of blockbuster events that consistently exceed all expectations, but the next blockbuster on the calendar may truly be the biggest in the history of the show’s 400+ episodes! 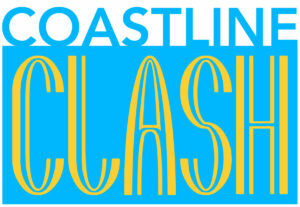 Coastline Clash will emanate from the beautiful Irvine Improv on the evening of Monday, May 13th at 7PM! 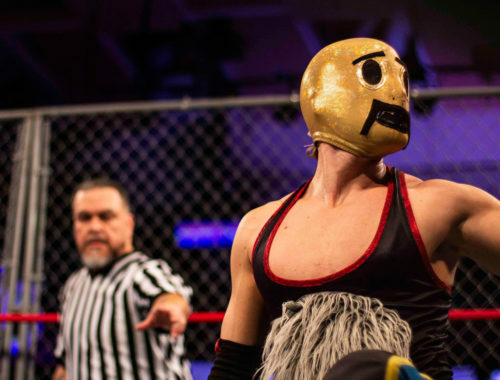 News of this Blockbuster Event has trickled South of the Border, as Lucha Libre legend L.A. Park struts back to the United States at Coastline Clash. Who will step up and square off with “The Chairman”? 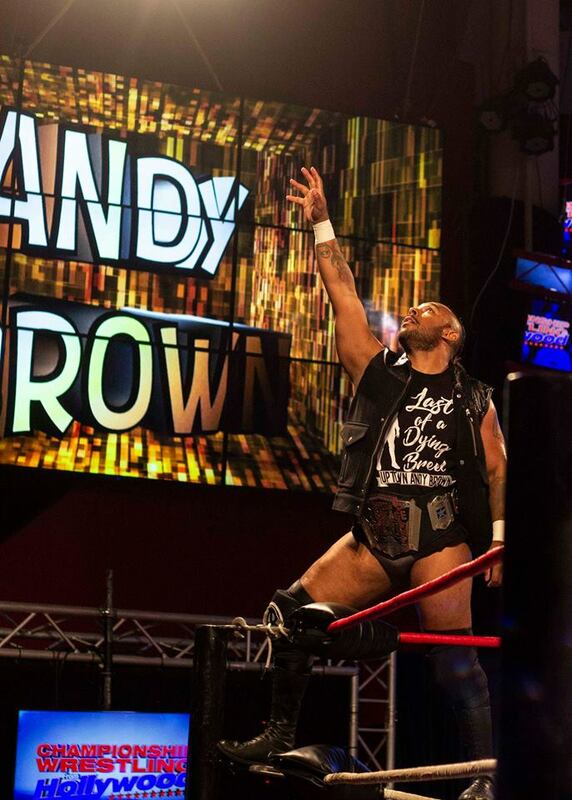 Hollywood Heritage Champion “Uptown” Andy Brown has shown himself to be a fighting champion with his Open Challenge title defenses, taking on all comers! But his confidence may have finally caught up with him, as his challenge has drawn the attention of “The Bull with the Golden Horns” Howdy Price and his loyal Ranchero Rogelio. Will the Ranchero find himself on the receiving end of a Package Piledriver, or will Brown’s Heritage Title finally be mounted on the hood of Howdy’s golden Cadillac? There are few competitors quite as synonymous with Championship Wrestling from Hollywood as Willie Mack, who has captured the admiration of wrestling fans across the globe. Willie will defend his NWA National Title against a dangerous man who debuted at last year’s Coastline Clash, the ever-spiteful Maxwell Jacob Friedman. 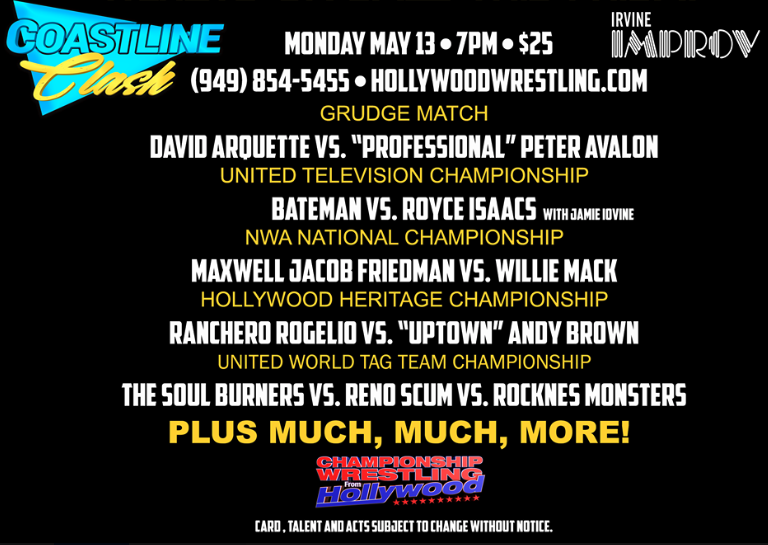 The tag team scene in Hollywood has never been hotter, as Reno Scum will defend their United Tag Team Titles in a four-way tag team match, taking on the Soul Burners and TWO sets of former champs in Double Platinum and the ROCKNES MONSTERS! ROCKNES has been preoccupied chasing clones all over the galaxy, but they’ll have to put that aside and focus if they want to de-throne Adam Thornstowe and Luster the Legend! “The Main Man” Bateman has been on a warpath since winning the PP3 Cup earlier this year, which he still has yet to cash in! Instead, a brazen Royce Isaacs has challenged Bateman to a match, with Isaacs’ Television Title on the line! Will “The Man from the Crossroads” leave with even more gold, or will Royce have reason to celebrate with Jamie Iovine and the rest of the Upper Class? 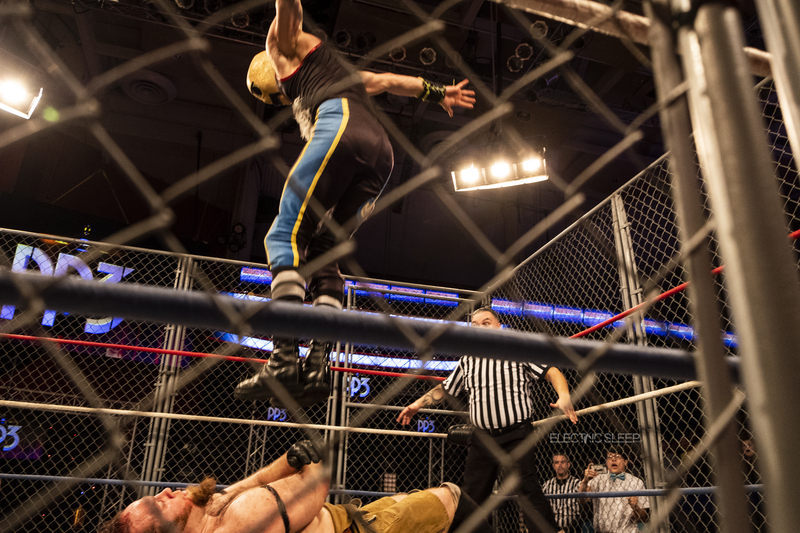 Ever since his explosive return to the squared circle, David Arquette has taken the wrestling world by storm, from his rivalry with RJ City to blood-soaked deathmatches. But “Professional” Peter Avalon is not impressed, even going so far as to claim credit for Arquette’s acting success! Therefore, Coastline Clash will see Avalon, the former Hollywood Heritage Champion, take on Arquette, the former WCW Champion, in a grudge match! The Irvine Improv is located at 527 Spectrum Center Drive, Irvine, CA, 92618. Tickets to this historic event are $25 and are on sale now! For more information, call the Irvine Improv at (949) 854-5455, and keep checking HollywoodWrestling.com or on social media @CWFHollywood! Card is subject to change. Week 2 of the PP3 Blockbuster was just as exciting as Week 1 and Week 3 proves to be. Here’s are some highlights of the episode, in case you missed it! 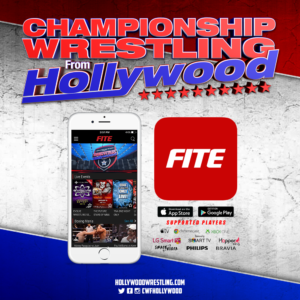 Full episodes of Championship Wrestling from Hollywood can be viewed on demand on Fite.tv and on the FITE app. “A cup of tea with my friends clears my mind before a big wrestling match,” chimes Gentleman Jervis while sweetly playing with his dog Lord Booplesnoot. 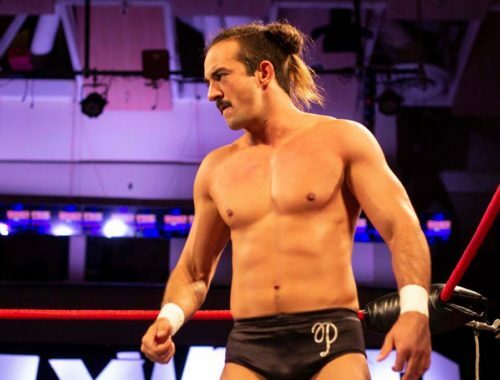 “Thomas makes a lovely Earl Grey.” 2019 has been a year of big opportunities on Championship Wrestling from Hollywood for the “World’s Sweetest Man.” After beating Robert Baines in a Steel Cage Match at the PP3 Blockbuster Event, Jervis is a new man. “For many years I have suffered from fainting spells, cowardice and all around fear. [In the cage] I had a choice to continue running away or to stand up and fight. I decided to fight.” And fight he did. Gentleman Jervis raised his fists to Baines and after landing a Bunny Hop Double Stomp off the steel cage, Jervis climbed out to victory. 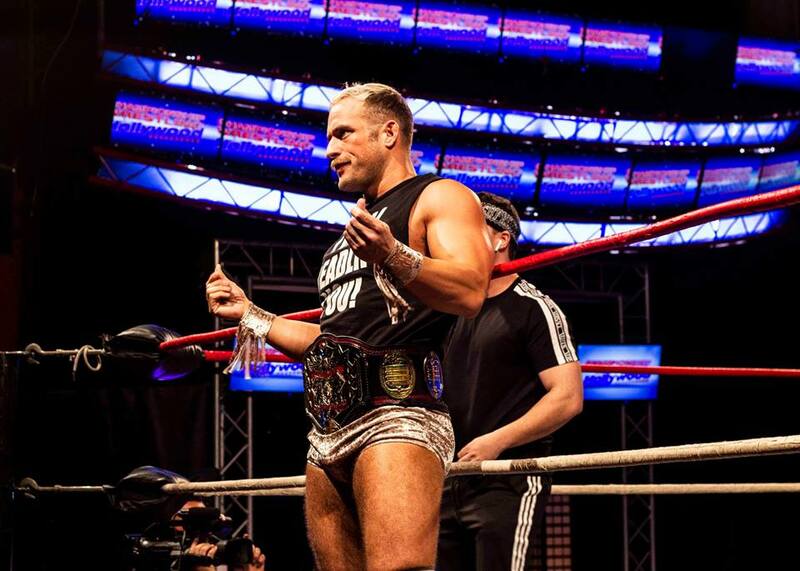 This put him directly in line for title opportunities across the United Wrestling Network, including a recent encounter against Hollywood Heritage Champion Andy Brown. “No matter what obstacles you face, do not despair and do not give in to fear. You are strong,” affirms Jervis, content in coming up short against Brown, but hopeful for his next title bout. “It’s time again to show everyone that I can be a winner too. I face quite a challenge in this Television Championship match. I hope Mr. Iovine and Mr. Isaacs are ready. I’m ready. Roar!” The undying support of Jervis’ friends and fans remains one of his main sources of inspiration going into this match on March 24. 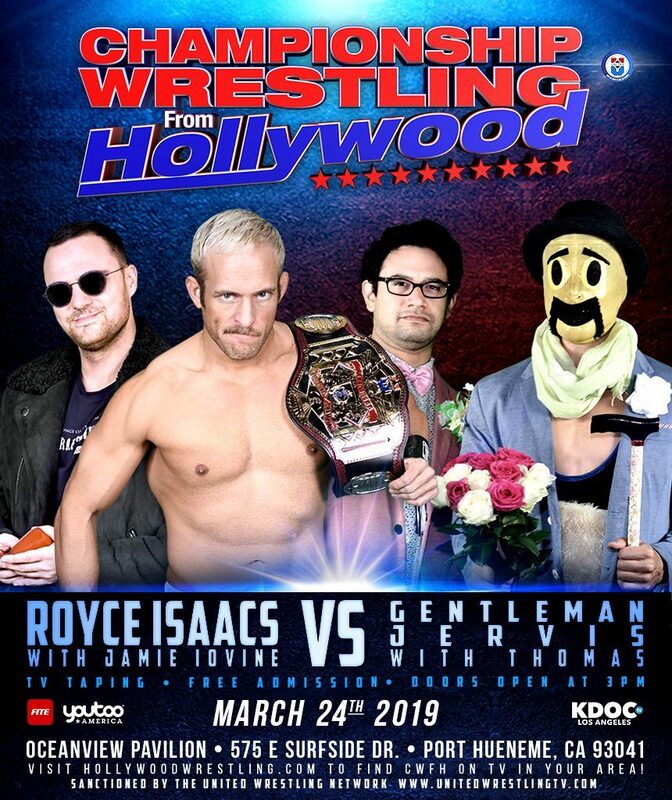 Gentleman Jervis challenges Royce Isaacs for the United Television Championship on March 24 at the Oceanview Pavilion. Don’t miss it! Oi! Oi! Oi! 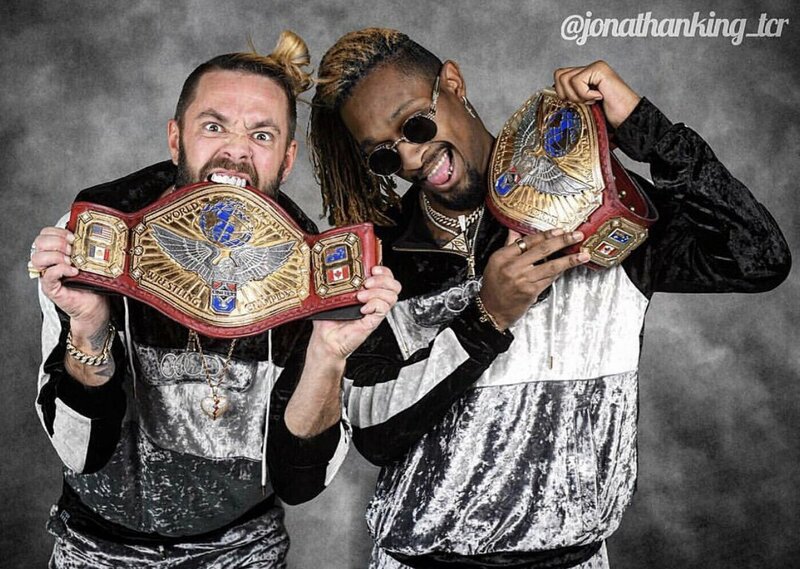 The wait is over and the longest reigning United World Tag Team Champions have returned to Championship Wrestling from Hollywood. After Adam Thornstowe was sidelined with an injury in late 2018, CWFH Minority Owner Nikko Marquez decided to strip the Reno SCUM of their titles for failing to defend within the United Wrestling Network in the stipulated 30 day period. ROCKNES Monsters were crowned the new champions on the landmark 400th episode of Championship Wrestling from Hollywood, but have since let those titles slip through their fingers and into the hands of Double Platinum. 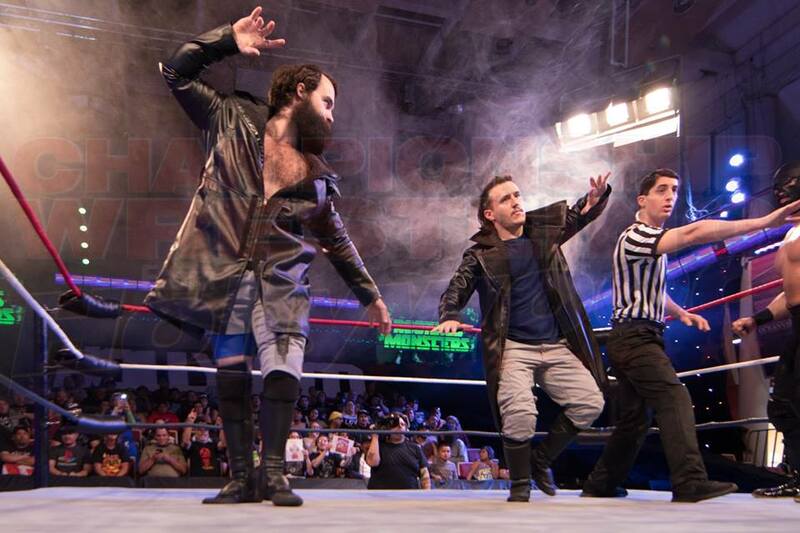 Nikko Marquez has announced that at the March 24th Television Event at the Oceanview Pavilion that Thornstowe and Luster will get their rematch for the United World Tag Team Championship in a Triple Threat Match. It will be Double Platinum versus ROCKNES Monsters versus Reno SCUM. Upon hearing this news, each team had words for their opponents. “The ROCKNES Monsters have survived heavy fire from all angles and fighting two excellent teams will be no different,” says YUMA while calibrating an unknown intergalactic gadget. “We were robbed of our titles, but justice will be served.” While the “Moon Man” and the “Ace of Space” are confident in their abilities to take on their foes, Double Platinum had less than respectful words towards the longest reigning United World Tag Team Champions. “Hasn’t anyone told [Reno SCUM] that Punk is dead? 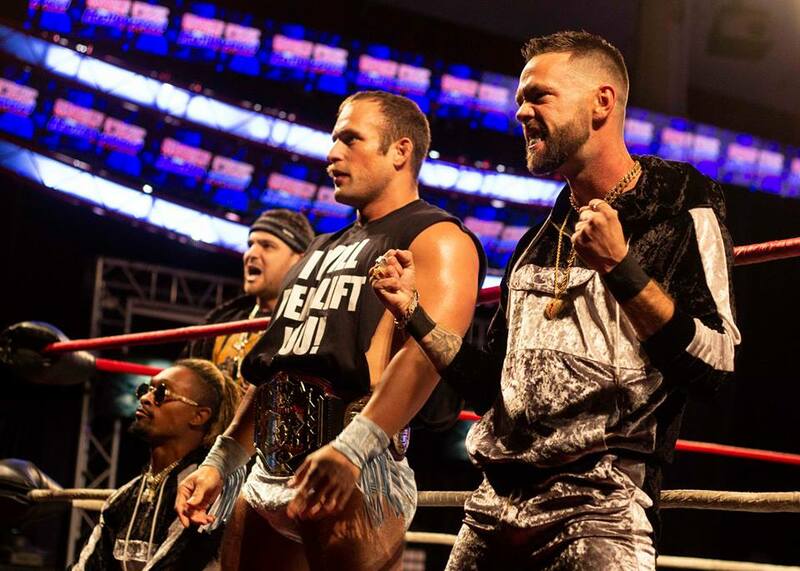 We’re the new wave,” boasts Suede Thompson, confident that Double Platinum will retain their titles on March 24. 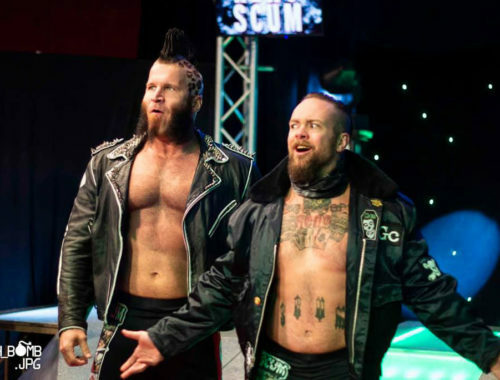 “We’re only worried about breaking records and holding gold.” HollywoodWrestling.com reached out to Reno SCUM to see if they feel that they are at a disadvantage by having to take on two teams for their rematch. “Double Platinum! ROCKNES Monsters! You will be silenced by the violence!” screamed Luster the Legend. From the sound of it, the former champions are more motivated than ever and nothing or nobody will stand in their way. 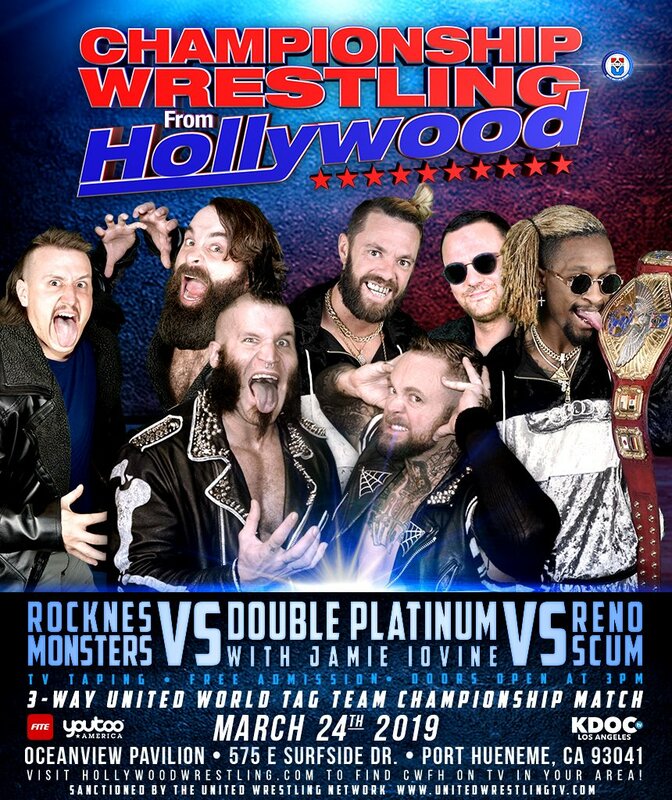 Make sure to be at the Oceanview Pavilion on Sunday March 24 as the United Wrestling Network World Tag Team Championship will be on the line as Double Platinum defend against ROCKNES Monsters and Reno SCUM! Watch Bad Dude Tito Challenge for the NWA Worlds Heavyweight Championship! 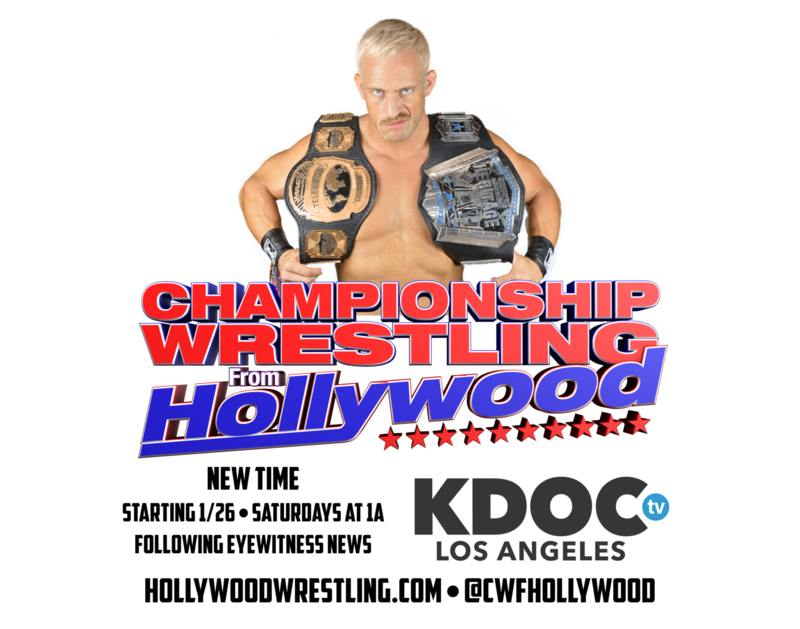 Hollywood, CA (January 7, 2019) – In 2010, Championship Wrestling from Hollywood (CWFH) premiered on KDOC-TV in Los Angeles and for the past 8 years the Southern California broadcast has become somewhat of a model for pro wrestling television efforts all over the world. Today the company is pleased to announce the hour long episodic program is moving times on KDOC-TV. Starting January 26 our programming will be found at 1:00A following ABC7 Eyewitness News. “In television it’s all about the lead in and I couldn’t ask for a better lead in than what I consider is the best TV/Media brand in SoCal, ‘Eyewitness News’. Championship Wrestling from Hollywood has been a leader in televised pro wrestling for the better part of a decade. We’ve been instrumental in developing some of the most recognized talents in the business worldwide and it is my hope that this move provides the current crop of talent viewership in the second largest media market in the country like we’ve never enjoyed before.” stated CWFH Owner and Executive Producer David Marquez. On 1/26 we’ll present our 400th broadcast that features United Wrestling Network Television and Hollywood Heritage Champion Royce Isaacs with Jamie Iovine, “Bad Dude” Tito, Ryan Taylor, Heather Monroe, Fidel Bravo, a Main Event United Wrestling Network World Tag Team Championship decision between Double Platinum and The RockNES Monsters and more! If you’re not in the Los Angeles area CWFH is distributed to over 120 domestic and international broadcast, satellite and online outlets including FITE. To find CWFH in your area please visit HollywoodWrestling.com or follow us on Instagram/Twitter @CWFHollywood. As 2018 comes to a close, Championship Wrestling from Hollywood is already looking forward the New Year. Grab a cup of hot cocoa and cuddle up with your favorite blanket as you catch this week’s episode! This edition kicks off with Fidel Bravo stepping into the ring with “Uptown” Andy Brown. Two weeks ago we saw Bravo qualify for the 2019 PP3 Cup Tournament by picking up a win over Vintage Dragon. Andy Brown is focused on his Hollywood Heritage Championship Ladder Match next week at Milestone. Is Fidel getting too big for his chones or will “Uptown” Andy Brown be too distracted thinking about Royce Isaacs to defeat “El Bravo”? Pinx chokes Andy Brown on the ropes while Bravo has the referee’s attention. Next we will see a featured Women’s Division matchup as Ayoka Muhara takes on Australian stand out Indi Hartwell. Hartwell recently picked up a sweet win against the confectionary competition of Zaida. As Muhara looks towards her Milestone opponent Heather Monroe, a win on an international star would surely drive home a message to “The Killer Bae.” Will Hartwell continue to live up to her “impressive” moniker or will Ayoka Muhara leave her opponent laying with the Powerslam? In our Main Event, the next entrant into the 2019 PP3 Cup Tournament will be decided in a Four Way Dance! It will be former Hollywood Heritage Champion Bad Dude Tito versus former United Television Champion BHK versus former CWFH Triple Crown Winner and the first PP3 Cup Bearer Ryan Taylor vs “Young Fuego” Adrian Quest. Quest has the biggest hill to climb in this Main Event, as he must take down a who’s who of Hollywood. Taylor knows the inner workings of Bad Dude Tito and BHK, but could he be too concerned with the disappearance of his partner Tomaste to focus? Is BHK too wrapped up in the investigation of Vermin to capitalize on this opportunity? Will Bad Dude Tito be able to set aside thoughts of NWA gold that await him at Milestone and qualify for a chance at a guaranteed title shot of his choice? 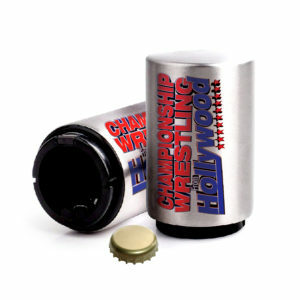 Tune in to this week’s edition of Championship Wrestling from Hollywood and find out! “Scrap Iron” Adam Pearce squares off against TJ Perkins in the program’s first Main Event. Championship Wrestling from Hollywood is just days away from celebrating its 400th Episode with a Television Event at the Oceanview Pavilion in Port Hueneme, CA on January 6th. 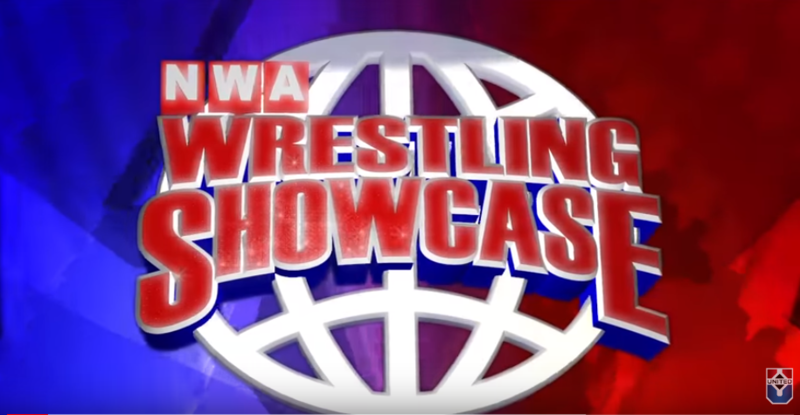 As we look forward to 400 and beyond, let’s take a look back at the very first episode of the broadcast that became Championship Wrestling from Hollywood. 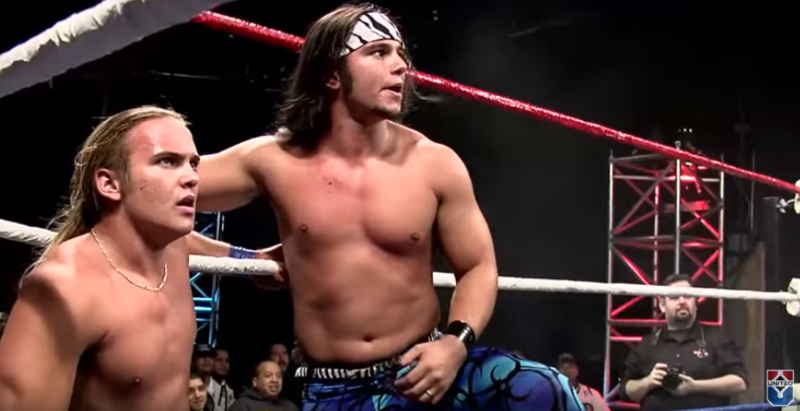 The Young Bucks are in action in the episode’s opening contest. Keep an eye out for some familiar faces and enjoy a glance at our program’s history. 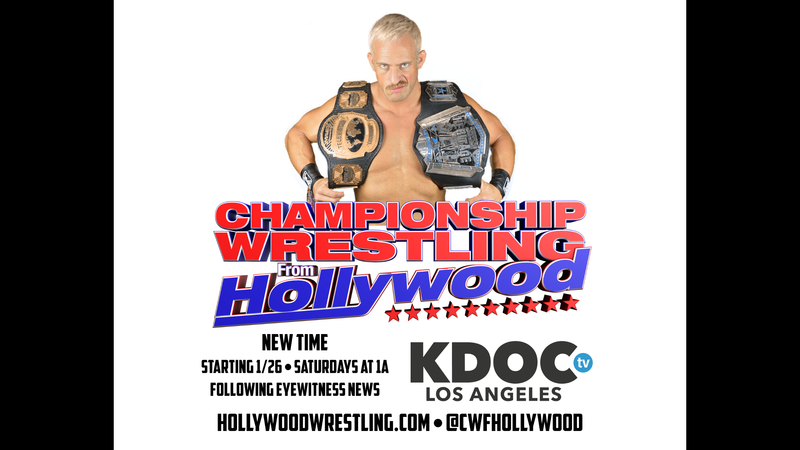 Championship Wrestling from Hollywood is set to hold its 400th Episode Television Event on Sunday, January 6th at the Oceanview Pavilion. Be there!